Learn C# Programming (in ten easy steps) [Version 2] is our premium level course for learning C#. It suitable for beginner programmers or anyone with experience in another programming language who needs to learn C# from the ground up. Step-by-step it explains how to write C# code to develop Windows applications using either the free Visual Studio Community Edition or a commercial edition of Microsoft Visual Studio (it even explains how to write C# programs using free tools for OS X). This is the completely revised and updated second version of this course. 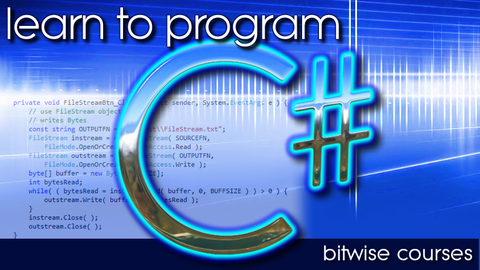 C# is one of the most widely used an important of all modern programming languages. If you need to learn C# quickly and painlessly, this is the perfect course. You will begin by learning the core features of programming – variables, constants, functions and data types. You will move on rapidly to learn about Object Orientation and the more advanced features of C# and the .NET framework such as file-handling, data-streaming, dealing with exceptions (errors) and overriding methods. Even if you start out as a complete beginner, by the end of this course you will have built a really solid foundation of programming knowledge and skills. All the source code of sample projects is provided ready for you to download, run and modify. The course also includes an eBook that provides even more information on the topics being discussed. The course instructor, Huw Collingbourne, is Director of Technology with SapphireSteel Software, a company that specialises in Visual Studio development tools (written in C#) for professional programmers. Learn C# Programming (in ten easy steps) is the fastest and simplest way to help you make the move from coding novice to professional programmer. The first version of this course was launched in 2012. The current version has been completely re-made and expanded with numerous new lessons. As an added bonus, the complete version 1 of the course (almost 4 additional hours of video instruction ) is also included as a free download. After you purchase Learn To Program C# it may be used indefinitely. Learn To Program C# is licensed per user, so if more people are going to use Learn To Program C# you will need to purchase additional copies. Each license allows installation on all owned computers, but Learn To Program C# may not be used at exactly the same time on each of them.